This issue's article is about a new initiative and a Trust that has been set up in India by Dr S. K. Cosmic Kapoor. The series of free internet lessons provided by Dr Cosmic Kapoor came to an end on 5th July. These are being followed by Yajur Veda Chapters 1 to 40 up till 14th August 2004. All the previous lessons are still available at the web site: http://www.learn-and-teach-vedic-mathematics.com/. But please note that they may be removed after that date. From 15th August a new series of Lessons will begin, based on "The Cosmic Trust Vedic Mathematics Cause". Some of the text of the Trust is reproduced below. New series of Lessons under the caption: "The Cosmic Trust Vedic Mathematics Cause" for literacy and proficiency in Mathematics are being planned for their launch on 15th August, 2004. It is going to be of one year duration as an endeavour to reach general people of the developing countries, particularly India, by having a focus upon one of its Districts as a unit as a practical test of the potentialities of the Ancient Wisdom. God has blessed our family with mathematics intelligence. We have accepted "Cosmic-as existence's middle name to remind ourselves of transcendental grace". This Trust is our family gratitude for the grace continuingly showering upon us for sharing bliss thereof with the fellow beings. It is the Vedic Mathematics cause which is the inspiration source for the present step for the establishment of the present cosmic trust. It has been my rare privilege to learn while sitting in the feet of His Holiness Sri Sri Pad Baba Ji Maharaj of Vrindavan and His Holiness Maharishi Mahesh Yogi Ji Maharaj of transcendental meditation enlightenment. This privilege initiated me for understanding and experiencing the potentialities and promises of Vedic Mathematics (which includes Vedic science and technology as well). The practical lessons of the Exponents are that dissemination of knowledge of Vedic Mathematics to include establishment of Ved press, Sashtra-Varsh Yajna and Statorams recitations for prosperity, knowledge and bliss. My interests and attempts to understand the basic values of Vedic Mathematics, Science & Technology, during these three and half decades, have convinced me that it is a cosmic cause to disseminate the Vedic Mathematics values. With this urge, the present step for establishment of the Cosmic Trust for Vedic Mathematics Cause is being taken. Vedic Mathematics vision of knowledge is that the whole range of knowledge, pure as well as applied, manifests and constitutes a single Discipline. This enlightenment of Ancient Wisdom with proper dissemination has great promise of complete knowledge within shortest possible time. As the unification of whole range of knowledge avails manifestations along geometric formats, as such the dissemination process gets further facilitated with availability of formats for chasing the manifestation phenomena, as well as the transcendence there from up till the ultimate Absolute state. Therefore this chase process of existence phenomena within frames has transcendental promises whose bliss is being envisioned to be shared with fellow beings as ideals and vision of 'the Cosmic Trust for Vedic Mathematics Cause'. This instrument is being executed this day 3rd of July 2004 by me, the undersigned, as settler and as the first sole trustee. The vision, an urge and the motivation, being as has been expressed above and whereas, there being the transcendental nature of Vision which at initial stage requires my personal focus, attention and the needed direction for the cause, as such the decision that till further enlightened beings may be persuaded to be trustees, the initial responsibility is taken as being upon me to perform and continuing as sole trustee of this Trust. 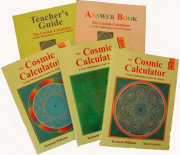 The objectives and goals of the Trust center around the sole cosmic cause for dissemination of the knowledge of Vedic Mathematics amongst the fellow beings for the mathematics literacy, mathematics proficiency and enrichment of life through Vedic Mathematics basic values inputs for development of technologies needed for our existence. (1) To persuade enlightened fellow beings to join for the cause and to share the responsibilities as trustees. (2) To draw concrete plans for dissemination of knowledge of Vedic Mathematics. (3) To take all other initiatives and discharge all other responsibilities for the cosmic cause of Vedic Mathematics. (4) To take all other steps, and to workout the details for furtherance of the interests of the present trust. The L D Institute of Indology, Ahmedabad, Gujarat are going to organise 3 days VM workshops at their Institute (from August 9th to 11th, 2004 in the evening, each day 2 hours) in association with World Academy For Vedic Maths. Manish Soni from Baroda will be conducting these workshops. Am also trying to fix morning workshops on the same dates which, perhaps, "Akshardham" may be organising which they would be confirming little later. Before these workshops I shall be going to Ahmedabad for extensive Press coverage. In all likelihood we shall be arranging 2 Press Conferences in the last week of this month. The contact # L D Institute is (079) 2630-7326 whoever wished to come can register. Jain will be one of the guest speakers at the next International Nexus Conference (Friday 24th-Saturday 25th-Sunday 26th September 2004. Venue: The Chifley at Lennons, Queen St., Brisbane, Australia). He would like to invite you to attend a fascinating 1 and a half hour Lecture on the bridging of Vedic Mathematics, Magic Squares and Sacred Geometry on Friday the 24th September 2004, 11.30am to 1pm. You can also check his website: www.jainmathemagics.com for further details to book online for a post-Conference 2-day workshop on the 27th and 28th September. (He will also be teaching in Sydney and Canberra all of June and then to America as a guest speaker at the International Feng Shui Conference in San Luis Obispo, California from the 6th to 8th August. Boulder, Colorado in September. Back to Brisbane for the Nexus Conference). Community here in Kuala Lumpur, Malaysia. increasing use of calculator in the secondary schools. regularly, once a week to be coached in Vedic mathematics. This year I conducted Vedic Maths workshops almost every week since April and many of them were on behalf of the Lohana classes and on behalf of The Indian Planetary Society. Each workshop was for 9 hours spread over 3 days. The participants were from all age groups and many were engineering students who were planning to appear for the CAT/CET exams this year. One student was interested in inviting me to his college. I, of course answered in the affirmative. These children definitely were very much interested in learning more of the advanced level. The basic level has aroused their interest so much that many wanted to learn more. I conducted about 10 workshops since April 2004 in the basic level and one in advanced level. They were very thrilled with the methods especially the one liners and the at sight methods. They definitely agreed that the methods increased their speed levels as well as understanding the numbers better. They said specifically that even with a little practice they could see improvement in their performance in the competitive exams. This is definitely a positive sign that VM is welcome among the student community. The World Academy for Vedic Mathematics, an integral part of the main foundation in Nagpur, the International Research & Resource Foundation for Indian Heritage is the core body working for the cause of Vedic Mathematics across the world. The Academy, in association with "Divya Chaya Trust", an organization primarily working for the upliftment of rural women and orphan people organized an introductory workshop on Vedic Mathematics on 12th July at a village at Rajarhat, a place near Kolkata. The workshop, which was first of its kind received overwhelming response from the 100 percent rural participants (village folks) and lasted for more than two hours. Twenty-two participants whose academic background ranged from Class X passed and above attended the same. The workshop started from 11:00 a.m. in the morning and continued till 01:15 p.m. The workshop was conducted by Debmalya Banerjee, the faculty of the academy on the subject from Kolkata. The expert not only explained the Vedic Methods of Calculation but also gave a brief introduction of the subject too. The organisers were eager to know the books, which are available on this subject and also the kind of courses. A comprehensive idea about Vedic Maths supported by examples in Nikhilam, Ekadhikena Purvena, Urdhava Tiryagbvyam, digital roots etc. were shown and also various types of multiplication rules were explained. The academy plans to hold more such workshops in future in order to reach the ultimate common mass. An article, by Marco Swaen, has appeared in the Dutch journal 'Pythagoras', June 2004 edition. It is called "Rekenen met sutra's - Ontbinden in factoren" and is on factorising quadratic and cubic polynomials. This is the sixth and last of a series of well-written articles by Marco; the diagrams alone make the Vedic method very clear.